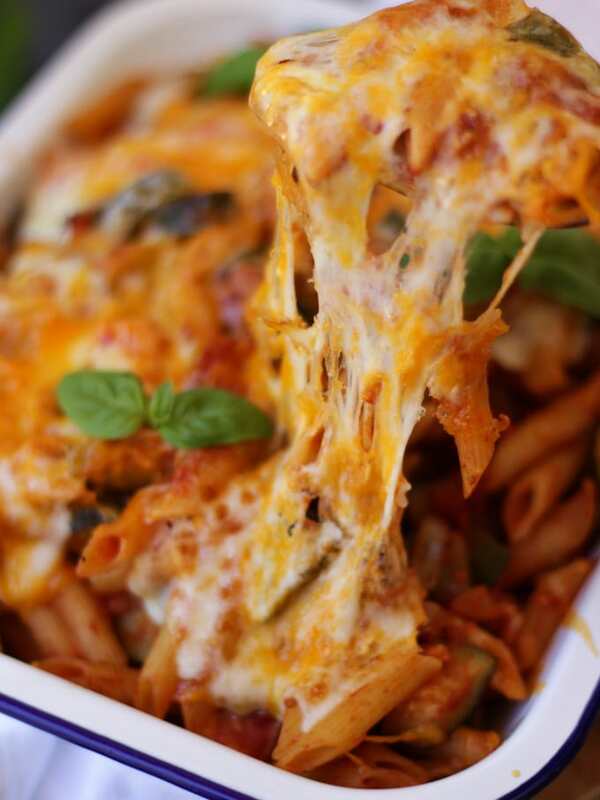 Pasta Bake Recipe with Chicken, Bacon and Cheese - Easy & Delicious! 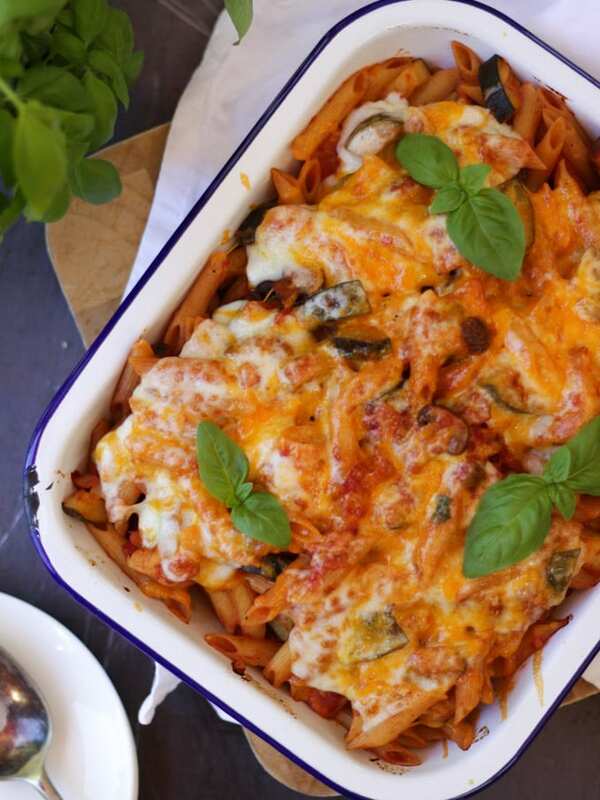 This Easy Chicken Pasta Bake recipe is a delicious and healthy dinner for all the family. The simple Italian style tomato sauce is packed with vegetables and bacon and topped with cheese. Kids will love this healthy recipe and if you’re following the Slimming World plan? No problem, this recipe is easily made Syn Free. Oh hello happy cheesy carby goodness! After days and days of gorgeous sunshine here in the UK, suddenly the heavens have opened again. On days like this, there’s only one thing for it. Our favourite Easy Chicken Pasta Bake with Bacon and Cheese. 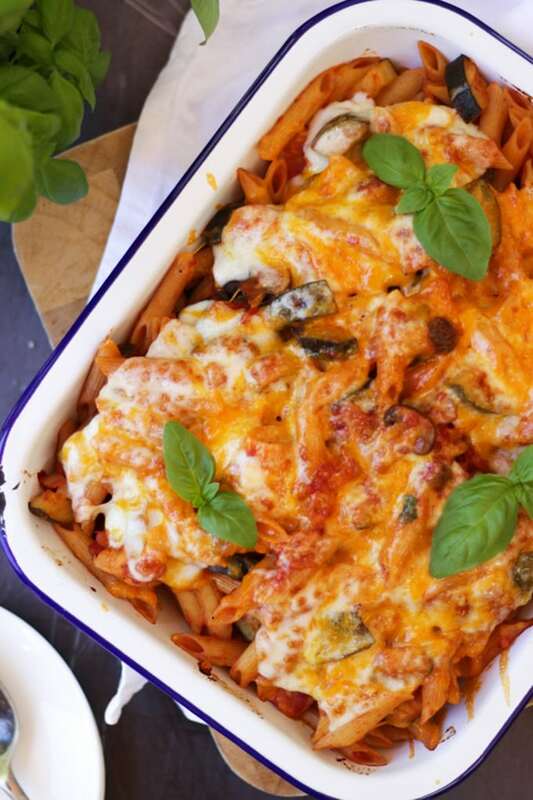 Every home cook needs an Easy Pasta Bake recipe in their repertoire right? Here is my offering. Tell me please, what do you put in yours? How do you make Chicken Pasta Bake? 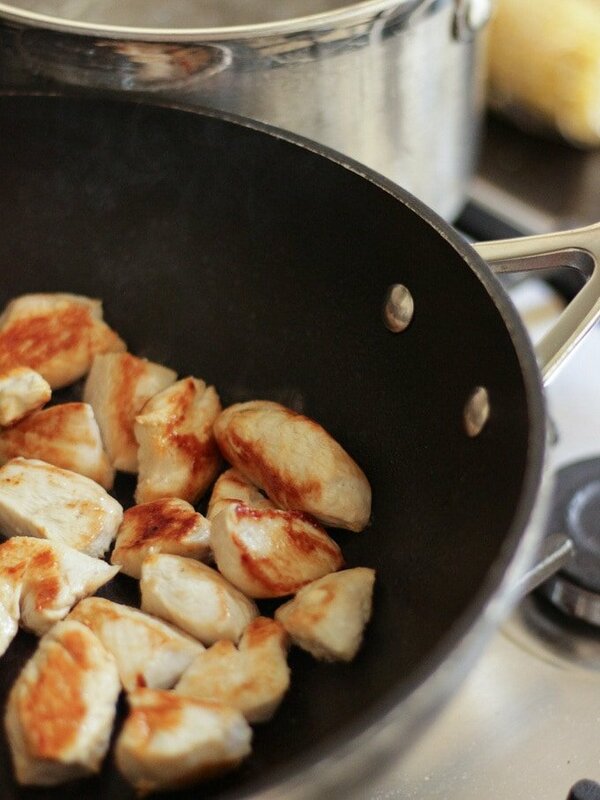 Start with chicken breasts, browned in a pan until delicious and golden. 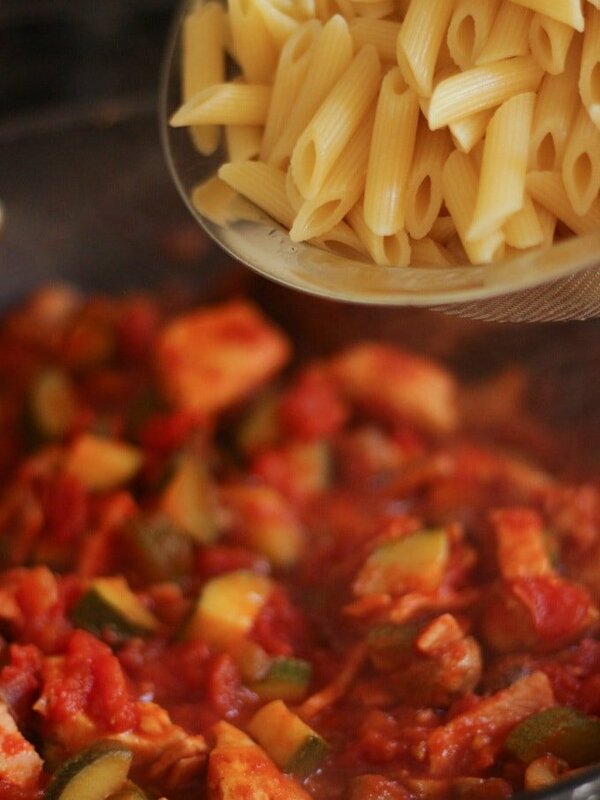 Add bacon, vegetables, tomatoes and herbs to make a gorgeous thick sauce whilst cooking your pasta in another pan. Drain the pasta, mix everything together and top with cheese. Bake until you have a dish of cheesy gorgeousness (totally a thing). How do you cook chicken to put in pasta? If you’re using uncooked chicken pieces, just fry them off gently in a pan until golden, then add to your sauce to finish cooking. If you have some leftover cooked chicken, you can use this instead, in which case, just add straight to your sauce without browning. Do you cook pasta before baking in a pasta bake? It’s always best to cook pasta in fresh boiling water and then drain before adding to a pasta sauce to make a pasta bake. This prevents the sauce from becoming too thick and means you can gauge the consistency of the sauce more easily. There are ‘One Pan’ pasta dishes, like my One Pan Spaghetti but they have a much wetter sauce to account for the starch for the pasta in the sauce. Do I have to cook pasta bake in the oven? No! If you’d prefer to not put the whole oven on for your pasta bake, you can just pop it under the grill (broiler) to melt the cheese on top. Just make sure that the sauce and pasta are hot all the way through from being in the saucepan before transferring to your shallow dish. Do I have to use Chicken and Bacon in this Pasta Bake recipe? No! 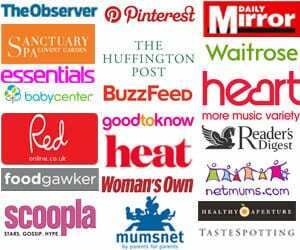 You can make a vegetarian pasta bake using this same format, but replace chicken and bacon with extra vegetables or Quorn, or omit entirely. Or my Mum often made this with drained tinned tuna fish to make a Tuna Pasta Bake. Just omit the chicken and bacon, and add a drained tin of tuna fish to the tomato sauce when you add in the cooked pasta. Alternatively you could add meatballs, sausage or chorizo. All delicious. This pasta recipe is already quite low in fat (and packed with veggies) but can be made super low fat by replace the Olive Oil with a spray like Fry Light and using very lean bacon. 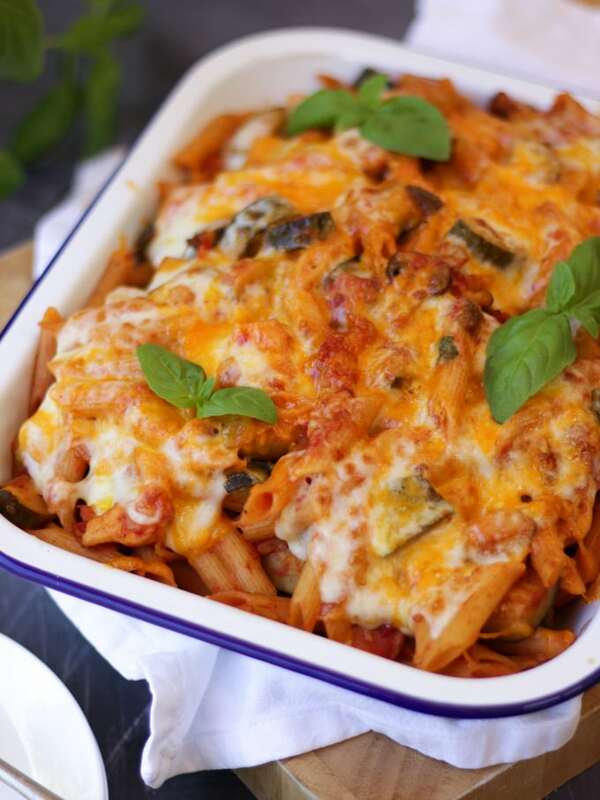 If you’re following the Slimming World plan, make those changes above and use your cheese as one of your Healthy Extra allowances and you have a delicious Syn Free Pasta Bake. Can you eat pasta bake cold? Yes! 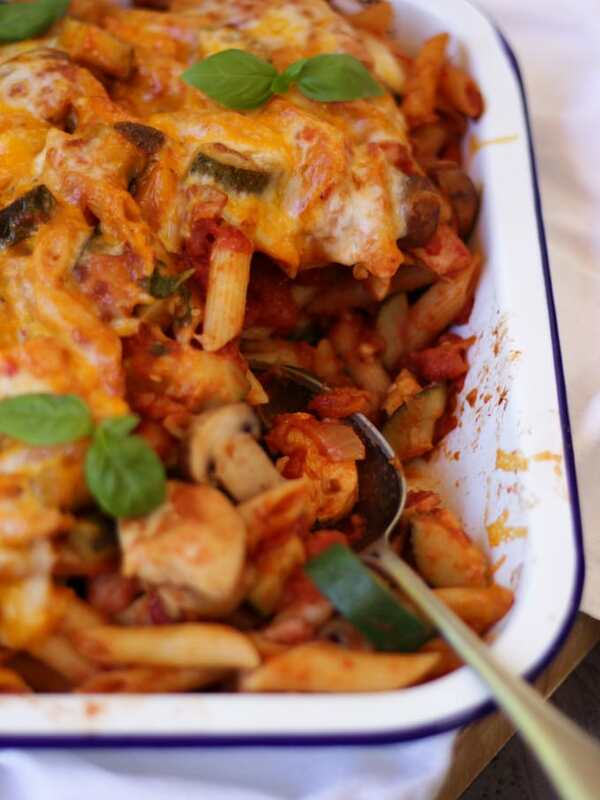 Pasta Bake is a brilliant dish to eat as leftovers or for a packed lunch or picnic. Just store it in the fridge until you’re ready to eat it (for not more than a couple of days) and enjoy. Can you heat up pasta bake? People often ask me “can I reheat pasta bake?” when I post a recipe like this. The simple answer is YES! As always with any leftovers, keep them in the fridge for no more than a couple of days. Then reheat until piping hot before serving again, and never reheat more than once. Lots of people have asked about the dish in these photos. It’s my most favourite enamelware. These dishes are light, easy to clean, look gorgeous and are super cheap. What’s not to love?! You can buy this one here on Amazon. Whatever timing that your pasta pack says, cook it in the boiling water for a minutes or two less. This means that when you add your pasta to the tomato sauce it won’t get over cooked. When you chop your fresh basil, squish it a little with your knife, this really brings the flavour out. Don’t like mushrooms or courgettes? Substitute whichever vegetables your family prefer. My Mum always used to make this with broccoli and carrots! You can use whichever cheese you like to top your chicken pasta bake, I like to use half mozzarella, for streeeeeeetchy-ness (is that a word?) and half cheddar, for flavour. Hope you enjoy this recipe as much as we do. I’d love to know how you got on and what you thought of it if you make this Easy Chicken Pasta Bake with Bacon and Cheese recipe. Please rate the recipe and leave me a comment below if you do. 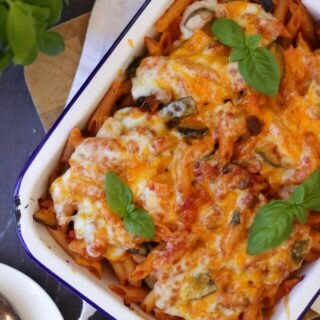 his Easy Chicken Pasta Bake recipe is a delicious and healthy dinner for all the family. The simple Italian style tomato sauce is packed with vegetables and bacon and topped with cheese. Heat the olive oil in a large pan, I like to use a wok as it's good for frying and cooking the sauce in. Fry off the pieces of chicken until they are golden brown. You may need to do this in batches so that the pan isn't over crowded. Remove them from the pan and set aside. In the same pan (there should still be a little oil left, if not add another splash), add the garlic, onion and bacon and fry off on a medium heat until the onion is starting to soften and the bacon is cooked through. This will take about 5 minutes. 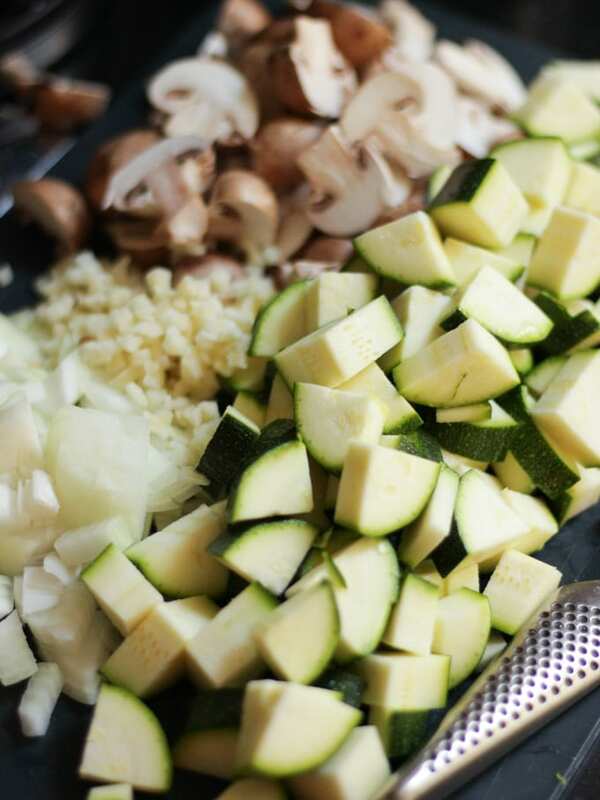 Add the courgettes and mushrooms and fry off for another 5 - 10 minutes until they have started to take on some colour. Add the tinned tomatoes, tomato puree, half of the fresh basil, plenty of salt and pepper and the browned chicken. Pop a lid on the pan and allow to bubble away on a low heat for about 20 minutes. Add the drained, cooked pasta to your sauce along with the remaining fresh basil (sauce a few leaves to garnish if you'd like) and give everything a good stir. Pour into a shallow dish and top with the cheese. Pop into the oven until the cheese is melted on top - about 10 minutes. Delicious and easy to make. Family favourite now.